The Trump administration announced a drastic $26 million funding cut on Tuesday for programs that provide in-person assistance to help people enroll in health insurance coverage. This announcement represents a cut of over 80% of funds in previous years along with other actions taken by the Administration to undermine the program, including removing navigator duties from trusted community and state-based organizations that know the populations they serve best, and placing them in the hands of entities that are not physically located where people who need coverage live and work. Navigators are intended to provide a vital service, offering clear, unbiased information for people to understand their insurance options, to receive financial assistance, and ultimately to enroll in and use their plans through health insurance marketplaces. The Trump Administration cited last year’s open enrollment as the “most cost effective and successful open enrollment to date,” stating the visibility and familiarity of the Exchange diminishes the needed for federally funded Navigators. We believe credit should be given where credit is due: the success of last year’s open enrollment was due to Navigators, certified application counselors, volunteers, and healthcare advocates across the country that employed Herculean tactics to stave off the Trump Administration’s persistent sabotage. Navigators, in particular, assist the most difficult-to-enroll populations across our state and have made the ACA a reality in every corner of our state, from the multicultural communities of Chicago to the most rural and isolated communities across Illinois. Consumers need trusted and unbiased assistance that will not steer them into non-compliant plans that may hurt them by not covering pre-existing conditions or failing to include the ACA’s essential health benefits. Given the continued attacks on health care, including federal rules allowing the resurgence of low-cost, junk health insurance plans, such as association health plans and short-term plans, consumers looking for good, comprehensive coverage could be easily confused. This is a time when consumers need more help to understand the insurance options that are available to them—not less. We call on Illinois’ Members of Congress to denounce the Trump Administration’s latest moves to undermine affordable, quality coverage for millions of Americans and provide a fast remedy to this situation and require funding for a robust, community-based enrollment assistance effort. Once again, Republican leaders in Congress are aiming to destroy the American health care system and they are hoping that Americans aren’t paying attention. Despite recent progress on health care, including a return to regular order and moving toward bipartisan proposals, a small group of Senators have remained committed to repealing the Affordable Care Act (ACA) and gutting Medicaid. The Graham Cassidy repeal bill is dangerous and we MUST do everything we can to stop this bill in its tracks. If this bill passes, the state of Illinois would lose $1.4 billion in federal Medicaid funding by 2026, rising to $9.26 billion in 2027. Call Gov. Bruce Rauner at 312-814-2121 NOW and demand that he publicly oppose the Graham Cassidy proposal. Governors have proven to be crucial in building opposition to ACA repeal in Congress, but Rauner has been silent as the health of Illinoisans hangs in the balance. The American public has moved on from repeal. They want and expect Republicans and Democrats to work together to stabilize the health insurance Marketplaces and take steps to help people afford the coverage that they need. This is where Congress should be placing its focus, not on a last ditch attempt to resurrect ACA repeal measures that the Senate has already rejected. Over the last eleven months, activists across Illinois have come together to save health care more than once. We know that it has been emotionally and physically draining, but we can’t stop fighting. Thank you for all that you have done and will continue to do. 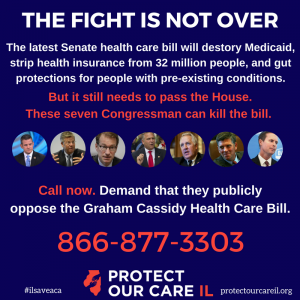 Protect Our Care Illinois calls on all members of the Senate to immediately reject the Graham-Cassidy-Heller-Johnson ACA Repeal plan introduced today. This latest ACA repeal bill is a huge step backwards just at a time when Congress was beginning to look for bipartisan solutions to help all Americans have access to affordable health care coverage. These four Senators are moving in opposition to the will of the American people and in contravention of the advice of their fellow Republican governors and colleagues who have been testifying and participating on the Senate HELP Committee this week to stabilize insurance markets and protect coverage gains. The news this week that the uninsured rates across the country continue to fall is encouraging but we must remain vigilant and not again entertain dangerous proposals such as this one that would eliminate the ACA tax credits and end the Medicaid Expansion (shown to be the primary coverage vehicle impacting the uninsured rate). It would also drastically limit Medicaid funding for seniors, children and people with disabilities. Now is the time to work together – not to go back to partisan, unpopular and dangerous proposals to end coverage that is working and needs to be supported not destroyed. Yesterday, the Trump administration took a drastic step to weaken the Affordable Care Act. Specifically, the U.S. Department of Health and Human Services announced a 90% cut in funding for advertising and outreach for the upcoming open enrollment period. Additionally, funding for the in person enrollment assistors, known as navigators, will be cut by $23 million. This announcement comes just two months before the newly shortened open enrollment begins on November 1 (ending on December 15). These cuts will weaken consumer support and education, potentially leading to fewer healthy people choosing to enroll or renew coverage on the marketplace this year. Despite claims of support for marketplace stabilization and a supposed desire to lower premiums, these cuts reveal the true aims of the Trump administration – to sabotage the ACA for political revenge by limiting access to enrollment assistance and marketplace education. Illinois has achieved an historic insured rate thanks to the ACA and the efforts of navigators in helping people enroll in the coverage they need. If we lose our ACA navigators, we will be in danger of reversing that trend line. We must maintain ACA funding for advertising and in-person enrollment assistance, any cuts to these crucial consumer outreach and enrollment efforts endanger the marketplace and compromise access to high quality health care for all Illinoisans. Protect Our Care Illinois urges the all members of the Illinois Congressional Delegation and Governor Rauner to pressure the White House to reverse this decision. Yesterday’s Congressional Budget Office (CBO) analysis showed that if President Trump cancels Cost-Sharing Reductions (CSRs) on Marketplace plans, like he has been threatening to do for months, he would be directly responsible for harm to millions of Americans, including Illinois residents. The nonpartisan CBO report shows that by cutting off CSR payments, Trump would force premiums to increase by 20% next year and 25% by 2020 and increase costs to the taxpayer by nearly $200 billion over ten years. This is sabotage, plain and simple, by the Trump administration. The CBO report also showed that the mere threat of Trump sabotage is already increasing premiums for next year. We’ve already seen the impact of this threat in Illinois: in preliminary filings, insurers on the Illinois Marketplace have assumed that CSR payments will not be made in full during 2018 and have raised proposed premiums dramatically in response. We call on President Trump to stop playing politics with our health care and give assurances that the CSR payments will be paid this year. We call on our Members of Congress to make a permanent, mandatory appropriation that ensures full funding of CSR payments. This is the best way to bring real stability to the marketplaces and erase uncertainty on this issue for the future. We call on Gov. Rauner and the Illinois Department of Insurance (DOI) to take the steps necessary NOW to protect 2018 Marketplace consumers so they do NOT bear the weight of these capricious decisions by our President. Our recent letter to DOI outlines the four steps they could take to protect Marketplace consumers before it’s too late.